Live on the wild side with a couple of beef-heart skewers, or anticuchos! 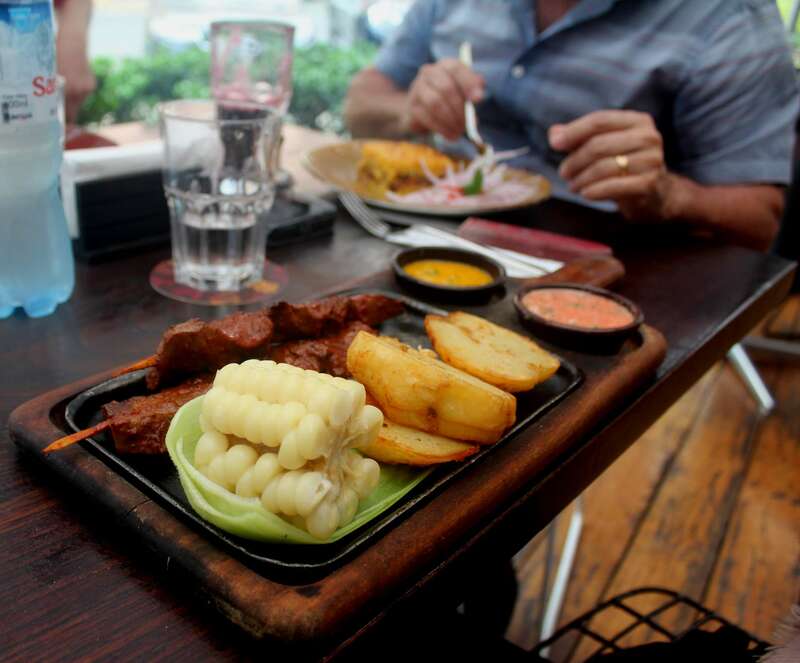 Popular Peruvian dishes now include the not-for-the-faint-of-heart anticuchos (beef-heart skewers), tamales (boiled corn with meat and cheese fillings, wrapped in banana leaves), tacu-tacu (a beans, rice, eggs and meat dish), pollo a la brasa (a Swiss-inspired, Peruvian-spiced rotisserie chicken), the Chinese-inspired lomo saltado, arroz con pollo (cilantro-flavoured green rice and chicken, which is an optional side at Peru’s KFC restaurants), aji de gallina (a yellow-chili milk-based sauce over strips of chicken on a bed of boiled potatoes)… and the scrumptious list goes on and on! Coastal Cuisine: I’ll Have the Tiger’s Milk, Please! The coldwater Humboldt Current that runs along Peru’s coast favours marine life, and keeps coastal tables afloat and full of abundant seafood-inspired dishes. 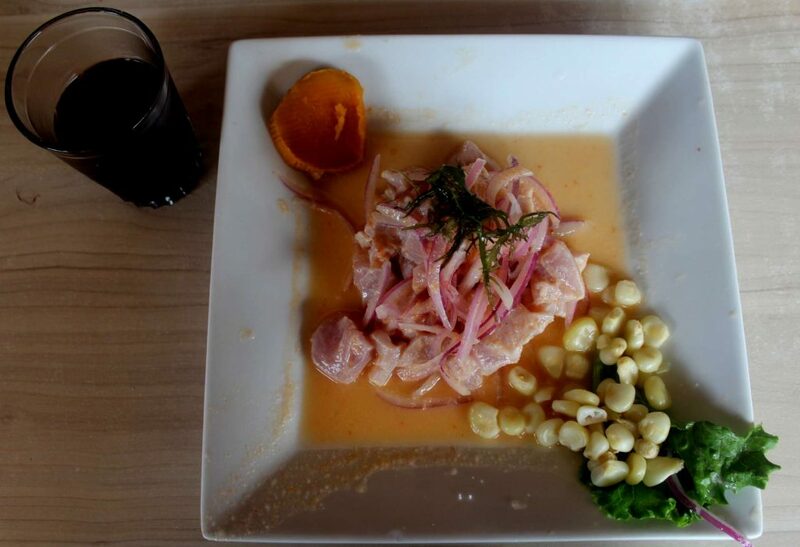 The most famous is, without doubt, ceviche (hypothesized to stem from the Quechua word for fish: siwichi), a plate of raw fish that’s marinated with onions and chili peppers and “cooked” in lime juice (a variety of lime brought by the Spanish). There’s nothing that brings more joy on the coast than fresh ceviche (also cebiche), a delicious raw fish meal, Peru’s national dish! You’ll always want to have the freshest version of ceviche, so order it for lunch like any Limeño – ordering raw fish for dinner will surely stamp the word “tourist” on your forehead. You’ll want to wash down the tiger’s milk, which is not actually milk from a tiger (though I wouldn’t be surprised if that’s a thing), but the locally known name of the juice leftover from ceviche: leche de tigre (tiger’s milk). It’s so tasty you can slurp it when you’ve finished your plate, or order it as a stand-alone dish – in a glass, that is. Other marine favourites include chupe de camarones (shrimp stew), sopa de mariscos (mussel soup), tiradito (similar to ceviche but the fish is marinated in a hot pepper sauce), chicharrones de calamar (deep-fried squid), and pescado a la plancha (grilled fish). Vegetarians and those with seafood allergies, you are warned! In Lima, bakeries sell out of fresh white bread every morning; it’s a staple of the Peruvian breakfast (whole wheat and gluten-free is difficult to find). For other meals, you’ll want to check out the local street vendors and markets, who often sell local specialties. Serious foodies will want to visit any of the three restaurants on the San Pellegrino list of best restaurants in the world: Astrid y Gaston (owned by top chef and Peruvian cuisine ambassador Gaston Acurio), Central (which allows you to choose dishes based on micro-climates and geographical origins of ingredients), and Maido (representing Japanese-Peruvian fusion food). The Museum of Gastronomy’s exhibits (Museo de la Gastronomia Peruana, also known as La Casa de la Gastronomia Peruana) in downtown Lima take you on a tour of Peru’s culinary progression of the past 2,000 years! 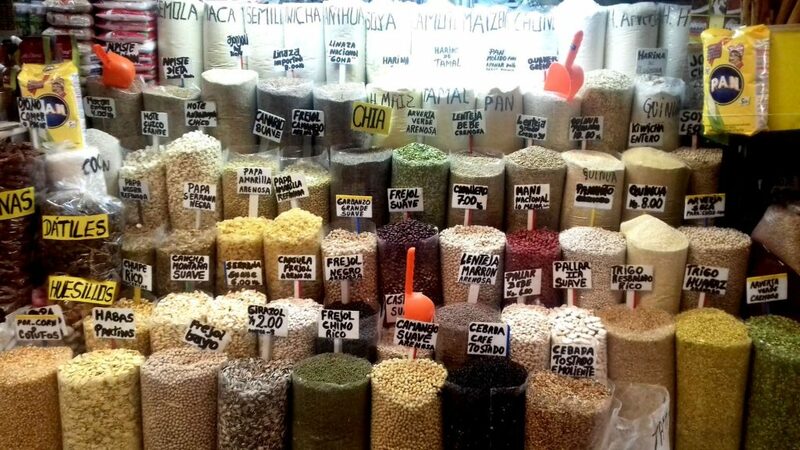 The food extravaganza of the Mistura Festival happens every year for multiple days in October, and is the largest and quite possibly the most significant food festival in South America. Your tastebuds will certainly want front row seats. 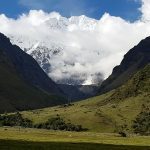 The Andes: Where Guinea Pig is Not a Pet! 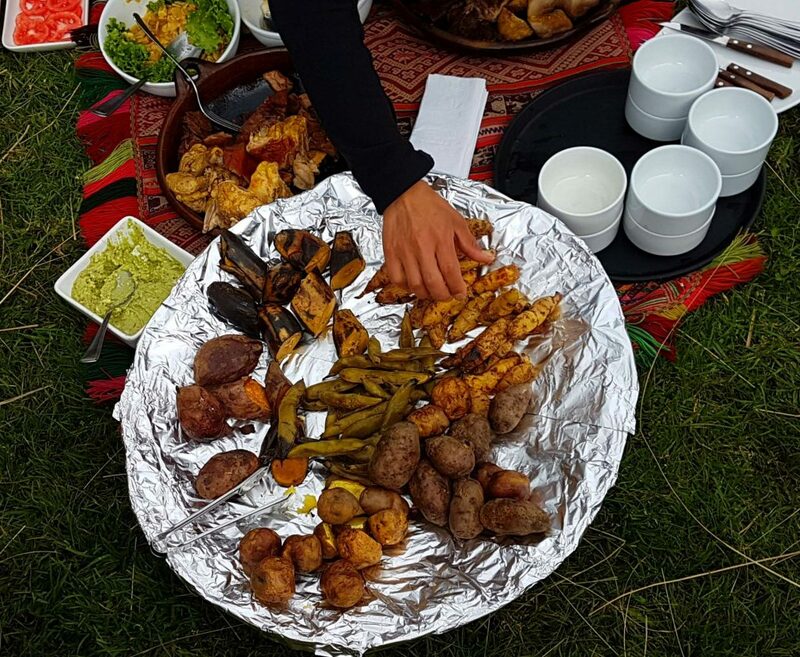 Cooking is an all-day affair at Andean events and festivals with pachamanca (which means “earth oven”), a style of cooking meat and vegetables and potatoes that involves digging a really big hole in the earth. That’s right: the entire meal is cooked underground on hot stones – it doesn’t get more authentic than that. 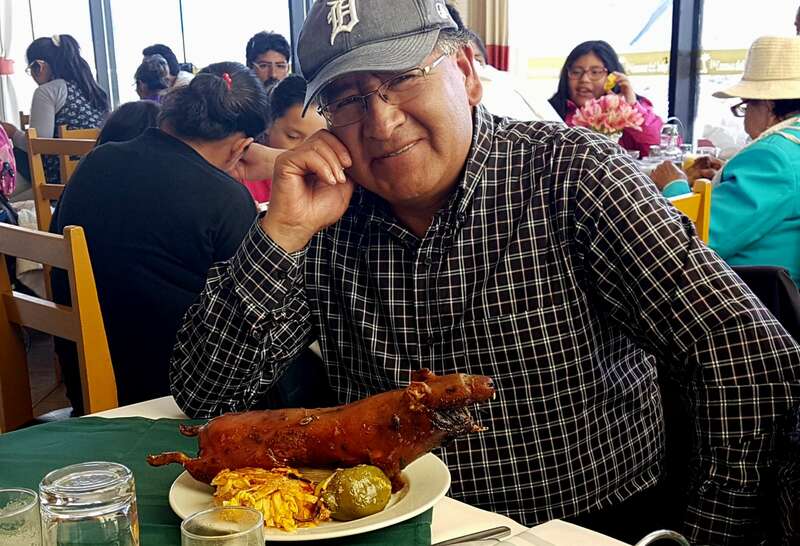 Regional dishes include rocotto relleno (spicy meat-stuffed peppers) from Arequipa, and papa a la Huancaina (potatoes with a spicy cheese sauce) from Huancayo. Lucuma, a subtropical fruit that is often depicted on pre-Inca pottery, is still a Peruvian staple, being use primarily in ice-cream and desserts. Purple corn is also a favourite. It’s used as a natural colourant, and also in drinks like chicha morada, and desserts like mazamorra. The Incas wisely fermented it into alcohol and used it in spiritual rituals. Also growing in the highlands, you can find the heart-shaped fruit chirimoya (called custard apple in English), and aguaymanto (a Peruvian cherry), which is a type of gooseberry used since the times of the Incas. Tuna (the fruit, not the fish) is a prickly pear that was also around for the Incas. It was often represented in ancient textiles, and is used to make non-fishy jams, juices and alcoholic beverages. 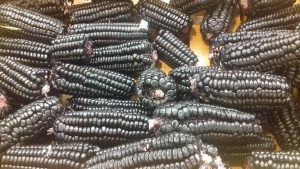 The indigenous purple corn, used by the Incas to make fermented alcohol. Fish is also a staple in the Amazon, where the rivers overflow with animals you can eat and sometimes even those that can eat you. You’ll find a jungle version of the coastal ceviche made with river fish, spicier jungle-style chilies and coconut milk. Patarashca, fish wrapped in banana leaves and cooked over an open fire, is a local favourite. Grilled grubs, made from big fat beetle larvae, are also on the menu. 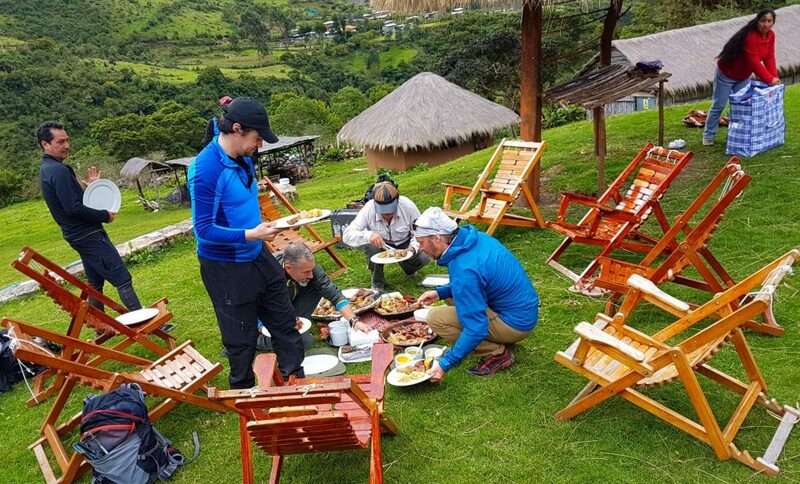 Most jungle eats are simple and so are restaurants – they usually consist of only a grill surrounded by tables. You’ll also find specialties like fried plantain and helpings of dozens of types of bananas (including the finger-sized variety) for the dozens of types of Amazonian monkeys. Additionally, the Amazon is home to exotic fruits, like aguaje (or palm-tree fruit), tumbo (banana passion fruit), pitahaya (dragon fruit), cocona (Amazon tomato), pacay (giant green bean fruit), guava, camu-camu (grape-sized fruit used to make immune-boosting juices), maracuya (a sour passion fruit), mamey sapote (orange melon), noni (a stinky tuber-like fruit with cancer-fighting properties, best served in a stew), and cacao pods (the edible fruit that houses the cocoa bean). Produce from the Amazon jungle is abundant, like these cactus pears. 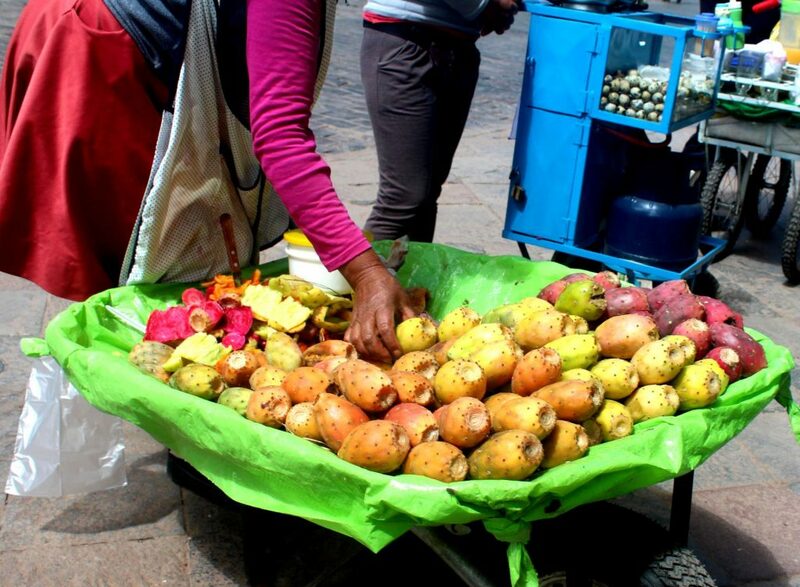 These unique fruits are used to make delectable smoothies, ice-creams and cocktails (most of which are made using aguardiente, a spirit made from sugarcane). And once you’re done consuming these alien-looking fruits, you’ll want to move onto out-of-this-world chocolate. Since cocoa beans and cacao pods are abundant in the Amazon, it turns out Peruvian jungle chocolate is some of the best in the world. 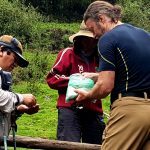 Peru’s super-foods can happily be added to any meal and beverage! On a few final notes, due to the endangerment of certain species, it’s wise to give crocodile and turtle meat a miss, if you encounter it in the Amazon. Besides conservation, Amazonian culture emphasizes natural remedies and health foods above all, which means you can supplement foods and smoothies with maca, cocoa, algarrobina (black carob tree syrup) and other “magical” healing powders! Carla Bragagnini, a Peruvian-Canadian, is infromtheoutpost.com PERU’s associate editor. All photos by her, unless otherwise credited.